Dr. Temt offers a complete line of hand care products. 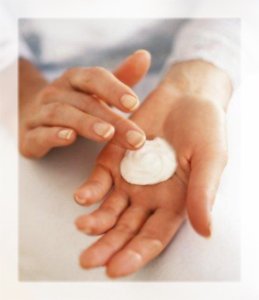 Although hand care is often neglected, it is as important as facial skin care. Special treatments include the Hand Ampoule and Mask, while the Silk Glove and Hand Cream are excellent products for every day use. An intensive hydration treatment for dry and mature skin. Enriched with natural botanical oils it regenerates and nourishes, leaving skin feeling silky soft. Recommended use as needed. After thorough cleansing, gently massage contents of the ampoule into the hands. Use in combination with Hand Mask for deep conditioning therapy. A non-greasy, light cream for the hands that absorbs quickly. Deeply hydrates, nourishes and softens the skin with marigold extract, watercress extract and glycerin. Use as needed. Apply a thin layer to the hands and massage in completely.